Originally published under the title, "Who lost Turkey?" Turkish President Recep Tayyip Erdoğan has long been a darling of the West. The question [of who lost Turkey] is no doubt too late and futile to ask. A quick, but realistic answer, is probably "the Turks themselves," or, related to this, "it was destined to get lost." After all, how Turkey is being governed today is a perfect reflection of what constitutes the predominant cultural, sociological and political values/norms in the country – each with economic derivatives of same or similar variables. We are all accountable by how rightly or wrongly we assessed the political phenomena; journalists by what accuracy their archives dating back to 10 or so years ago would produce, and politicians by their statements in the same retrospect. Any randomly selected opinion in this column since 2002 would too boringly portray the gloomy country we live in today, often with a note that "wished to be wrong." Western words about Erdoğan and Turkey make for a colossal anthology of how not to deal with Islamists. Former President George W. Bush said in 2004 that Turkey demonstrated "how to be a Muslim country and at the same time a country which embraces democracy and the rule of law and freedom." Judging from where Turkey stands today in view of all the virtues Mr. Bush mentioned, his statement is not even funny. Condoleeza Rice argued in 2007 that the Justice and Development Party (AKP) "has been dedicated to pulling Turkey west towards Europe." Her homework in 2015 should be to write that line 200 times every day – until the day Turkey becomes an EU member. Swedish Foreign Minister Carl Bildt said the AKP "is made up of profound European reformers." (2008). This is one of my favorites. Mr. Bildt does not even need homework. History will remember him as a politician with an exceptional foresight into Turkish (and Islamic) politics. President Barack Obama predicted that Turkey and the U.S. could build a "model partnership." (2009). And in 2015 President Recep Tayyip Erdoğan is still wondering why "I had very good relations with Obama when I first came to power … but [now] we see things have started to develop in a different way, which I barely understand." Why, really, does Mr. Obama refuse to be cheated anymore? Why does he no longer see that his model partner is a cradle of democracy and freedoms? Odd. America, again. Former President Bill Clinton praised Turkey for its "successful endorsement of secularism while letting people express religious beliefs without imposing them on others." (2009). What a visionary. And, according to former German Chancellor Gerhard Schroeder, a democracy like Turkey is "proof that there is no contradiction between the Islamic faith and an enlightened society." Maybe. But Mr. Schroeder's homework should be to write 500 times every day that "Islam is different than political Islam." Stephan Füle, the EU's enlargement commissioner praised Turkey's "remarkable advances in reforms." (2010). Very good. In Mr. Füle's vision, Turkey should have become a member five years after he diagnosed good health. Maybe this year it will? One feels tempted to drink the same beverage Mr. Füle drinks: it must be causing mental wonders. Tony Blair, in his memoirs, praised Mr. Erdoğan and his one-time ally and former president, Abdullah Gül, as "sensitive and foresighted people … easy to reconcile with." Mr. Blair's punishment should be to be appointed as U.N. special envoy for oversight of democracy in Turkey. 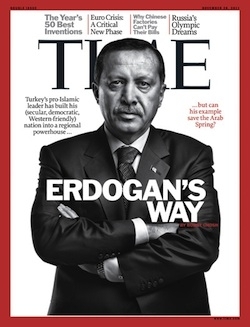 Forget Time magazine's 2011 cover on which Mr. Erdoğan was Person of the Year. Forget, also, Elizabeth II, Queen of the United Kingdom and other Commonwealth realms, and her "ah-but-Turkey-is-a-bridge-between-the-west-and-east" parlance. Among all contenders for the prestigious "1st Traditional How to Most Tragicomically Read Turkey Prize," the winner, for this columnist, is Danish Prime Minister Helle Thorning-Schmidt for her unchallenged: "I complimented the [Turkish] president on the progress on democratic reforms and improvement of fundamental rights." Ms. Thorning-Schmidt said that in 2014, which is why she is also the front-runner in the "Naïve, Myopic and Morally Corrupt Enablers" category.